Meg over at Me with the Three posted this fun little Q&A on her blog the other day. She passed it on to anyone who wanted to participate! I love doing these kind of posts, because it's just another way for us to get to know one another. Plus, this q&a had some unique questions, so it really stuck out to me! Here we go! My ability to adapt to change. For some, change may scare them to all end, but I welcome it. There have been lots of things that have changed in my life, and while not all have been good, they have all taught me something. It's allowed me to adapt more quickly when things to do come up. I'm strange in the fact that I do like a routine and enjoy it, but eventually I will get bored and need something new. Too long in one place or in one routine and I get restless. 2. Briefly explain the name of your blog. The name Polished Arrow came about in a couple of ways. One, when I moved to Alabama, my dad got me interested in archery and I fell in love with it. It's such a fun sport and I really feel like I missed my calling to be in the Olympics. ha. not really. Two, there is a verse in Isaiah that says, "He made my mouth like a sharpened sword, in the shadow of his hand he hid me; he made me into a polished arrow and concealed me in his quiver." One study bible said this verse was a metaphor for "the effectiveness of the word." And how the word is sharp, like a sword, penetrating us with its words. Words are powerful and I want to use them to speak truth, life, and love. Check out this post for more on why I chose this name. 3. What is your favorite thing about the city or state that you live in? I was born in Memphis, so when my Dad told me we were moving to Alabama when I was in the eighth grade, I didn't really know what to think. My perception of Alabama was that it was nothing but small towns and wide spots in the road. Well, that is true of where I live, in my small town. But, because of it's size, I knew almost all of the 75 people in my high school graduating class, people knew me by my mascot name (and still do), and I got to know the simplicity that is small town life. Then, there are the cities, where you can visit the big stores, go to the movies, explore museums. In the northern part of the state there are mountains, rivers, and hiking and in the southern part there are rivers for fishing, rich history, and beautiful beaches. Also, I got to attend The University of Alabama, where I learned that tradition is important and college football gets in your blood. 4. What is the best book you've read recently? I recently finished I Am Malala. It is the story of Malala Yousafzai and her family as they experience terrorism in their home state. Malala herself was targeted by the Taliban, and shot at the age of fifteen, as she is an incredible voice in fighting for her and all girl's right to an education. It's an empowering story of a young girl who refuses to be silent. I started my first blog awhile ago, just as an online journal and to keep up with adventures. When I started this blog, I had just moved back from California and needed an outlet. This space again became an online journal of sorts, a place to share my photos, build community, and document life as a single, twenty-something. I recently did a post on my writing process and finally came to the conclusion that I am a laid-back lifestyle blogger. 6. What is something you think you are really good at? I would say capturing, remembering, and enjoying the simple moments. I remember the weirdest of small details, but to me those are the ones that make the moments and memories sweet. I've been told that I have an eye for photography and sometimes I do manage to get a great shot, but I'm by no means a professional. I'm also better with written words than speaking them. My thoughts make way more sense and come together a whole lot better when they are written down. My dreams change a lot. There are lots of things that I would love to be able to do one day. Let's just name a few. Photographer, writer, full-time missionary, travel blogger, photojournalist, graphic designer, teacher, non-profit worker, child and teenage counselor. There is one dream that I have that right now that I never thought God would place in my life. It's something I never really thought of before and still seems silly to say out loud. So, I'm going to keep it to myself for a little bit longer. But, I think it would be one of the best jobs in the world. 8. What time of day do you feel most creative? Definitely mid-morning and afternoon. This is when I usually have the most time to set my own schedule and I'm alone. It helps me to organize and brainstorm what I want to do for the day. During this time is when I write most of my posts, organize social media, and clean up the blog. Sometimes I get the urge to write at night and will crank out a post or two then. 9. What food could you eat every day and never get tired of? Popcorn or ice cream sandwiches. 10. Name something you would like to accomplish in the next year. Land a full-time job, that I actually enjoy, that is all I ask. Or live the life that comes with that dream that God has placed on my heart right now. Did you enjoy this Q & A post? Hope you learned a little bit more about me. Now, I would love to learn more about you! I pass the challenge on to you all. If you do this same Q & A, make sure to let me know and leave your link in the comments below! 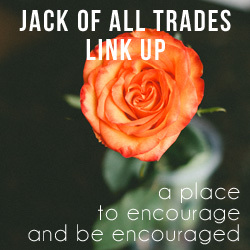 I'm very excited to be linking up for the first time ever with Chantel and her Jack of All Trades Link-Up!